Analysis are ONLY for quick trades and NOT long term investments. Always define risk, allocate accordingly and understand the game you're playing! (eg: a chart dated for today is intended to be played for tomorrow and possibly the following day). IF it should be played at all. Currently short. 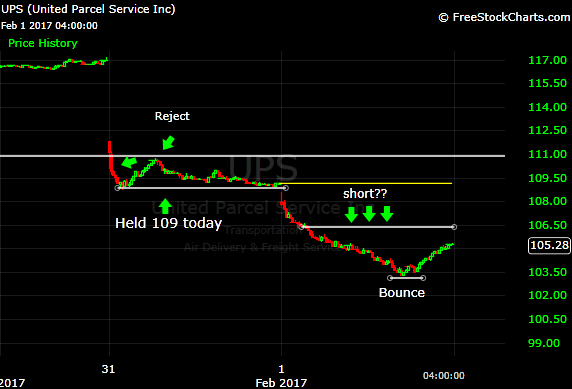 Stock ranged between upper 111 to high 108s. 110 level rejected today. Held 109 a good deal of the day (battle ground level for me). Going into tomorrow and the remainder of the week; I would like to see it blow through 109. Don't forget to sign-up for our free newsletter and follow me on ALL social media. So looking at the short play from yesterday; we entered our position around 110; and saw 109 hold the majority of yesterday. 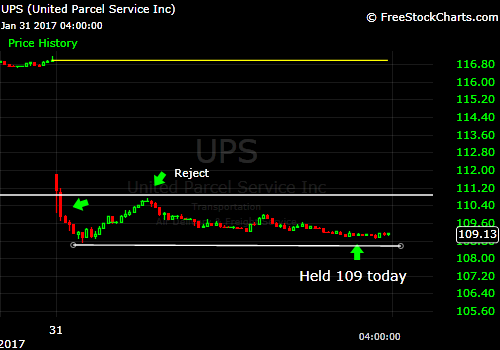 We didn't have to wait all week; the stock opened below 109 and it was all down hill for UPS. Going as low as 103.23 today (+7 points overnight). After hitting the low of 103.23, the stock reversed and closed at 105.28. There's a possibility we have an up day tomorrow. I am looking at the 106/107 levels for an add. Let's see what tomorrow brings. ​This set up works. Well, it works atleast 50% of the time (arbitrary number but it works). The stock gaps down. Go short! 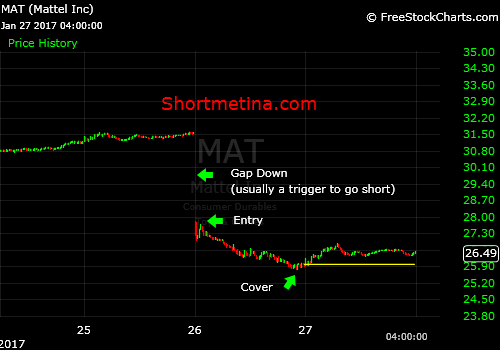 Entry isn't super important as long as you follow the trend (going short w/ a gap down). If you're concerned with entry give the trade some time to show you an ideal entry. But again; you'll get a good % gain over the course of a few days/ weeks. ​Don't forget to sign-up for our free newsletter and follow me on ALL social media. Swinging Visa for several weeks now. 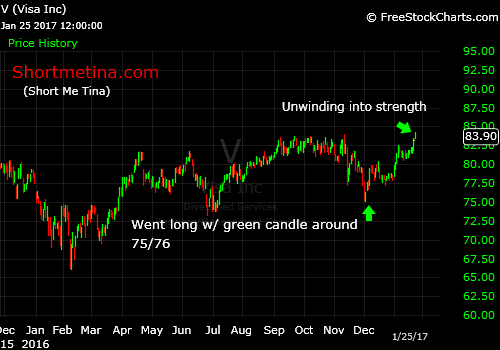 Entered on the first green candle after the sell-off; using the previous day's low as my risk. The stock consolidated for a few days before making the next move towards the upside. Easier to unwind (sell shares) into strength. +8 or so points. I continue to speak about following the trend. Whether it is the intra-day trend, daily trend, monthly trend, etc. Unless a stock is basing or consolidating; there is a trend. I suggested life is easier when you trade in a manner consistent with the trend. 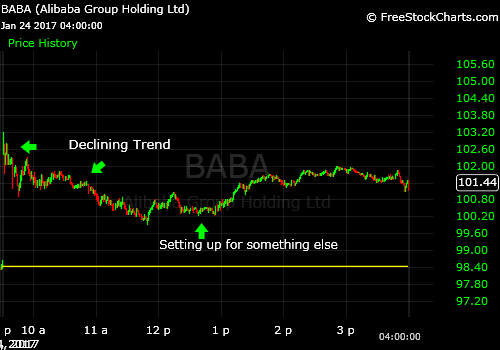 That was done today in this BABA 'intra-day' trade. ​Early in the morning; I identified the trend was in a decline. 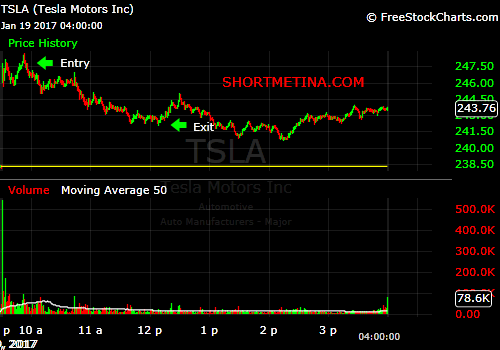 I want to short stocks that are in a downtrend. Went short around $102 and covered in the low 101s, high 100s. ​If we just look at trading action today; the trend sticks out like a sore thumb. Trading in any other direction but that of the trend is what? You guessed it; it's fighting the trend. Currently in this trade; will detail it when I am out but key levels I am paying attention to is 138-140. Mainly 139 ish. That seemed like a real battleground level today. 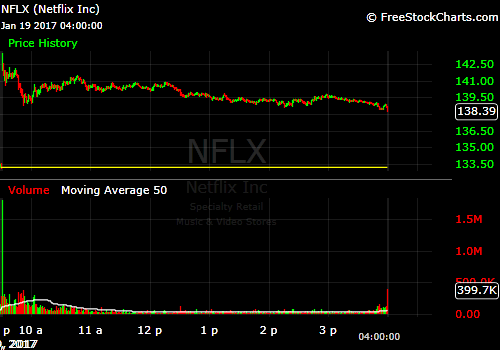 Went short when the stock had a hard time penetrating and staying above pre-market high of 248.66. Short avg around 247. Covered short around 242. +5 points. Looking for the gap of 238.68 to get filled at some point. We came close today with a low of 240.75 before we got that bounce. 245 is a key level for me tomorrow. No current positions. I have every intentions on taking a position providing an opportunity presents itself.